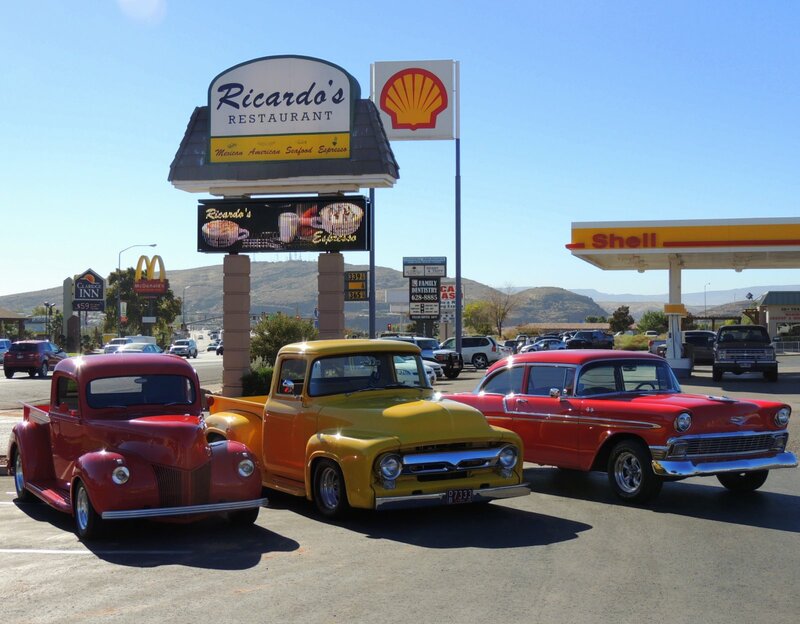 ST. GEORGE — The fourth annual Car Guys Care Toys for Tots Classic Car Show & Shine will take place in the parking lot of Ricardo’s Restaurant, 1110 S Bluff St in St George, Saturday from 2-4 p.m. This year’s car show is presented by Southern Utah Mustang Owners Association & Classic Ford Club, Rods & Rebels Hot Rod Club, Color Country Corvettes, Southern Utah All-Gens Camaro Club, Dixie 4 Wheel Drive, and MSG Productions. 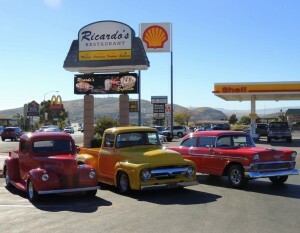 For the past three years, the event has been held at the Iceberg Drive Inn, 222 E St George Blvd in St. George, but the parking lot of Ricardo’s Restaurant will provide more room for all the cars, said Shane Dastrup, president of the Southern Utah Mustang Owners Association & Classic Ford Club. In past years, some cars have had to be turned away because of minimal room in the Iceberg Inn parking lot. 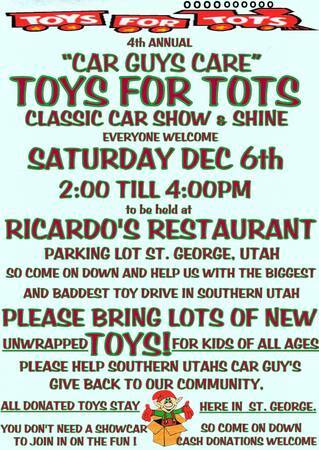 Everyone with a car, truck or motorcycle is invited and encouraged to bring monetary donations, unwrapped toys, enjoy looking at cars and spend some time with Santa Claus. Please do not wrap your toy donations. All toys collected at the car show will go to families in the community. A live band performance by The House of Flying Monkeys, and a live remote broadcast from Cherry Creek Radio’s John and Dave Hiatt, as well as food are all part of the event’s offerings. Prior to the first year of the car show, the car clubs had been collecting toys but wanted to find a way to distribute them, Dastrup said. 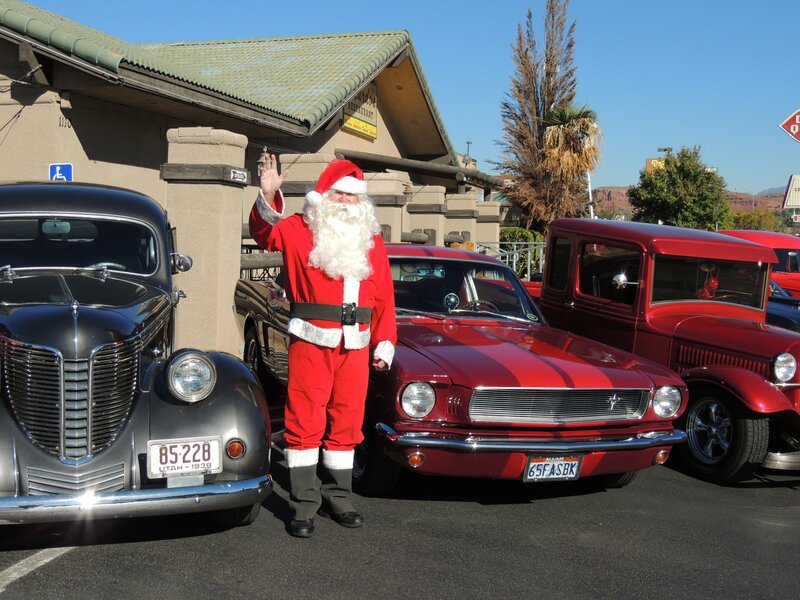 The clubs then worked together to start Car Guys Care and create a car show to support the Toys for Tots Foundation. In 2010, Dastrup and Heinz helped the U.S. Marine Corps distribute the toys and described the opportunity of taking toys to needy children eye-opening. Giving monetary donations is important, Dastrup said, because those donations are used to buy toys for children who are older than infants and toddlers. Toys for Tots coordinators are given a list from each family to find out how many children are in each family as well as what each child’s wish list is, Dastrup said. He said the list enables Car Guys Care to get toys for the older kids. Last year, a member from one of the clubs brought three bicycles and spent between $3,000 and $4,000 on toys. Toys for Tots is the Marine Corps’ nationwide organization that started in 1927. It did not have a chapter in Southern Utah until retired Marine Gy. Sgt. Rick Massey, who had been on recruit duty in Washington County during his service, was appointed to coordinate the program in Washington County. Before Massey became the Toys for Tots foundation coordinator in Southern Utah, all donations collected in the area were sent to northern Utah. The number of toys collected grew from hundreds to thousands after Massey began coordinating the effort. About 110 businesses throughout the community regularly support the Toys for Tots program by putting a box out at their businesses to collect toys, Massey said. People are encouraged to go the stores, buy toys and fill those boxes. Or, people can make monetary donations on the Toys for Tots website. When: Saturday, Dec. 6, from 2-4 p.m.
What: Red Rock Running Club Toys for Tots Fundraiser. A 1-mile, 5K and 10K race will take place in support of Southern Utah Toys for Tots. When: Saturday, Dec. 6, from 8-11 a.m. When: Saturday, Dec. 6, from 9 a.m. to 5 p.m. When: Saturday, Dec. 6, 10 a.m.
What: Association of Retarded Citizens Dinner. The Elks Lodge will be sponsoring a dinner for ARC. The Marine Corps will assist other volunteers and local law enforcement agencies to help with the dinner. Mr. and Mrs. Santa Claus will be present to hand out gifts to ARC. When: 5:30 to 9 p.m.
What: Coins for Kids Shopping Spree. The Marine Corps will join forces with KONY Coins for Kids and the community to support the shopping endeavor. Bring your best walking shoes and smiles to enjoy an evening of shopping and fun. When: 5 to 9 p.m.
What: Coins for Kids Present Deliveries. Anyone can help make deliveries to the kids. What: Toys for Tots Deliveries. Anyone can help make deliveries to the kids. When: 9:30 a.m. to 1:30 p.m.
Where can we find a full list of places with drop boxes if we want to donate? Go to http://www.toysfortots.org, click on toy drop locations, Utah, Washington County, then click on the icon for toy drop locations, local events, family toy request forms, etc. Never mind. I’d be asking the impossible.